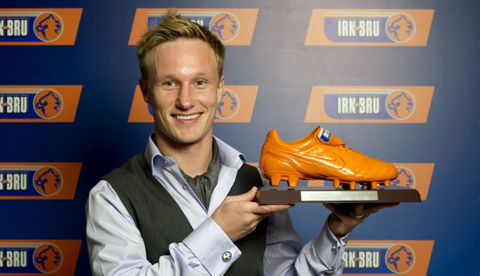 The best of the Scottish Football League was celebrated last night (Thursday 26th May) at the annual IRN-BRU SFL End of Season Awards. The event brought together clubs, players and managers from all over Scotland, to celebrate their contributions to what has been a phenomenal season across the SFL’s First, Second and Third Divisions. Compèred by Bill Leckie at the city’s Old Fruitmarket, this year’s awards featured coverage of the season’s highlights - including the biggest games, greatest goals, and the key individuals as they shared their thoughts on the SFL season. Paul Lambert, Manager of Norwich City, was the event’s guest speaker, and the event also celebrated the successful partnership between the SFL and IRN-BRU, which is now in its fourth year. The night was a great success, and saw Arbroath picking up a hat trick of awards with Manager Paul Sheerin, Player Gavin Swankie and Young Player Josh Falkingham all recognised for their successful season. 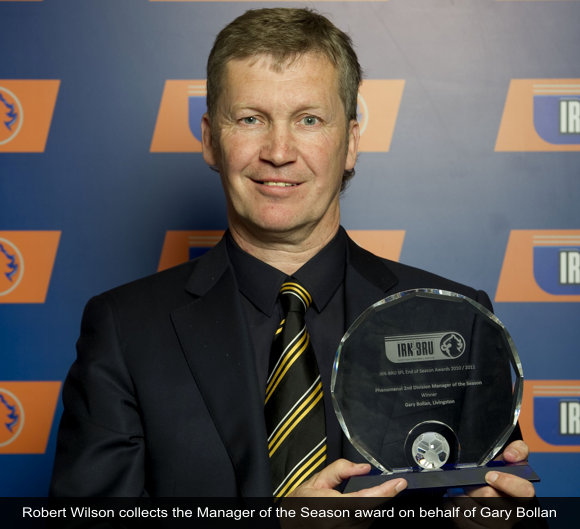 Raith Rovers were awarded for a phenomenal performance in the 1st Division following their promotion last season, while Gary Bollan was also awarded 2nd Division Manager following similar success last year in the 3rd Division. All the winners were selected following a judging process by top Scottish sports media. The eagerly awaited results of IRN-BRU’s Tops for Youth Teams campaign were also announced, with the £70,000 investment in youth development being shared between all 30 SFL clubs. The top winners were Falkirk, who were delighted to take the first place prize of £10,000, Stenhousemuir in second place, with a prize fund of £7,000, and Greenock Morton in third place, winning £5,000. “There have been so many high points this season that it is impossible to single out just one. Up and down the country fans have been turning out in to see some great football, and this event gives us a chance to bring everyone together and to recognise their performances. "This season’s Tops for Youth Teams has been particularly significant, with a total investment of £70,000 in the future of Scottish football. It has been great to see all the clubs and local communities unite to collect almost half a million bottle tops and help their club grab a bigger share of the cash prize. “The End of Season Awards is the culmination of what has been a truly great season for everyone involved in the 1st, 2nd and 3rd Divisions. From the beginning to the end we have seen players give their all, and the passion shown by everyone involved is something that I think cannot be surpassed. “The relationship the SFL has with IRN-BRU goes from strength to strength, and their continued support and investment in the game is invaluable. The remaining £39,000 will be spread amongst the remaining SFL clubs. Please visit www.phenomenalfooty.com for more information.